The law required men between 21-35 to register with local draft boards. On September 1, 1939, Germany invaded Poland, precipitating (starting) World War II. Britain, France, Australia, and New Zealand declared war on Germany two days later. In April and May 1940, Germany invaded Denmark, Norway, Belgium, Luxembourg, the Netherlands, and France. However, the United States maintained its neutrality. The United States had a small military that was unprepared to fight what would become a global war. Many Americans were isolationists and wanted to avoid international entanglements. Nonetheless, by 1940, many in the public and in the government had concluded that the United States would eventually be drawn into conflict with the Axis powers, and support for American intervention on behalf of European democracies was growing. 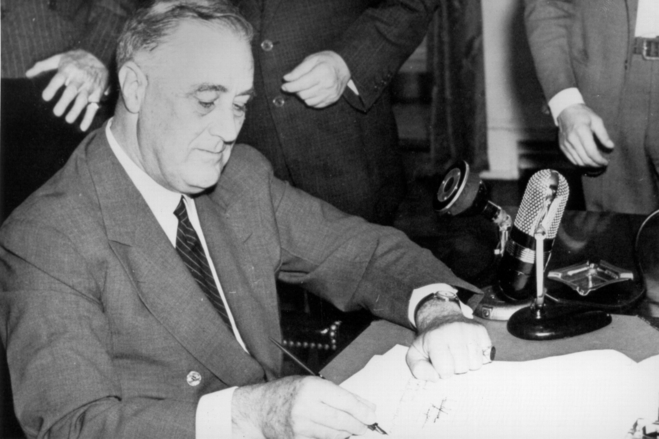 On September 6, 1940, Congress passed the Selective Training and Service Act, and on September 16, 1940, President Roosevelt signed it into law. Also known as the Burke-Wadsworth Act, the Selective Training and Service Act of 1940 required that men between the ages of 21 and 35 register with local draft boards. It was the first time in US history that the country had begun mobilizing an army while still at peace. Later, when the US entered World War II, all men aged 18 to 45 were subject to military service, and all men aged 18 to 65 were required to register. By the end of World War II, 50 million men between eighteen and forty-five had registered for the draft and 10 million had been inducted into the military. September 6-17, 1940 News articles about passage of the Selective Training and Service Act. September-October 1940 Editorials, op-eds, letters to the editor, and cartoons reacting to passage of the Selective Training and Service Act.